Netflix is getting smoked as the tech selloff continues. It’s still one of the best performing tech stocks in recent months. 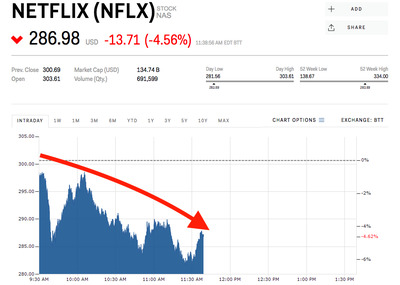 Shares of Netflix dropped as much as 7.2% Wednesday as the tech sector at large remained under pressure, continuing its slump fuelled by fears of a crack down on Chinese investment in US tech companies. The stock is now down 10% for the week. Facebook began to drag the sector down last week, officially entering a bear market, when the Cambridge Analytics data scandal came to light. Ongoing fears of increased regulation have dragged down Twitter as well, which has also lost about 10% this week. Amazon, largely seen as one of Netflix’s biggest competitors on the video-content front, was also down more than 6% Wednesday after an Axios report said President Trump wanted to go after the company. Netflix has been one of the top performing stocks in recent months, outpacing all of its FAANG peers, but Wall Street appears to have changed course in recent weeks. Analysts polled by Bloomberg have an average price target of $US282 for the stock, just below where shares are currently trading. Netflix is up 42% so far in 2018.